Tension and suspense are two key qualities on Door: a gargled alto sax squawk lurking in the distance, stop-start beats played on the rims of the snare and bassy piano lines played in the low register more than make up for the trio’s lack of the stringed instrument. These elements also make Fieldwork’s third album an engaging and important release. 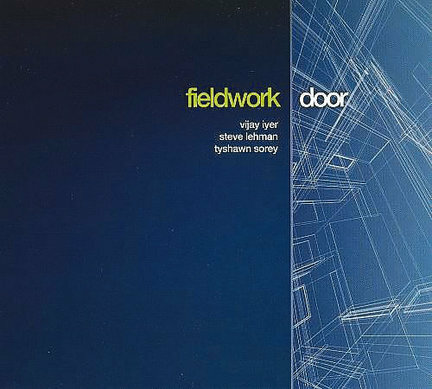 Tyshawn Sorey (drums), Vijay Iyer (piano) and Steve Lehman (alto saxophone) each contribute tunes to Door, playing them in a manner that avoids theme-solo-theme structure for a performance that centers on group interaction. Sometimes the music sounds free and open, with all three playing parallel to each other, only to snap into a motif that clearly puts them all on the same page. This can heard in opening track “Of,” which begins sounding like three independent but like-minded warm-ups until Iyer begins feeding chords to Lehman, who shortly thereafter starts a harmony with the pianist’s lead. The deep-seated rapport continues through the album, climaxing in “Rai,” on which the stop-start melody and Storey’s taut rim work make you wonder if the CD is skipping. That might jar some listeners, but those with open ears should find this fascinating, with new discoveries arriving with each listen.